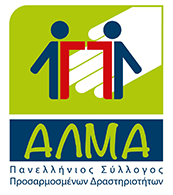 The Pan-Hellenic Association of Adapted Activities “ALMA” is a non-profit association, with decision number 4533/1996, registered in the National Register of Non-profit Bodies of the Private Sector of the Ministry of Health (OGG 494/1-10-2015), while at the same time it has an Operational Adequacy (Ref. No 2815/01.03.2011). The association is managed by a five-member board with a three-year service. ALMA was founded in 1996, when a team of scientists of various specialties –from the domain of special education– decided to contribute to the acceptance of difference in all aspects of life. With our vigour and love for children, all these years, we plan and realize numerous programmes for children, teenagers and adults with disability (autism and mental disability), aiming at their psychosocial development and total integration in a society of equal opportunities, supporting at the same time their families. Little by little, the team of ALMA is becoming larger, it develops and it renews, embracing more and more people with or without disability and their families. Our association addresses ALL children and young people who see life from a different perspective.